Domain names are all the buzz these days, but most people donâ? ?t know much about them. 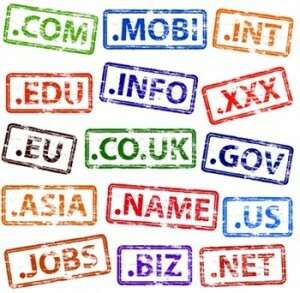 You may have heard of generic top level domains (or simply gTLDs). This is just techie jargon for domain extensions like the everyday .comâ? ?s or .orgâ??s. gTLDs also include a host of other options like .mil or .museum which are restricted to sites who can offer proof that their services are related to the extension at hand. There are dozens of other extensions showing up in this level of domains including .app or .info which are becoming increasingly popular. The next type of domain extensions that we will be focusing on are country coded, also known as ccTLDs. These offer endings specific to various countries. Whereas gTLDs have three or more letter endings, all official ccTLDs have a two letter suffix. The first country coded domains were registered in the late 80s, but it was only recently that they became more commonplace on the web. These domains have opened up more possibilities for some creative names, think of all the possibilities with Italyâ? ?s extension – more on this later! Now that you have a simple understanding the two primary types of top level domains, which one should you be focused on for your own personal or business website? The choice may be more important than you realize. Picking an international domain can be great, especially if you want to be ranked higher in that specific country. If you are a Canadian firm picking a Russian extension, you might need some more creative marketing to get to the top of relevant search results. Another issue with ccTLDs has been utilizing search engine optimization properly. Most tricks are much more effective with gTLDs. Why should I register a country coded domain? The primary benefit of going with a country specific extension is to target a specific audience. Your site will appear higher on all local searches just based on its domain. To maximize exposure, you may want to register multiple domains with various target countries and write your site in various languages. Country coded domains show your clients from the first blink of their cursor that your services and products are available in their area, and, perhaps more importantly – that you care. Country coded domains also let the creative people out there have some serious fun with their domain names. If you donâ? ?t believe me, check this out. You donâ? ?t have to get that wacky to make a catchy domain though. There are already some massively popular pages like About.me which use ccTLDs to come up with a catchy domain name. If you market your brand heavily, web placement will be more than OK with a cool name like this. Imagine a fashion company with a name like Wear.it! The possibilities here are great for any forward thinking company, and you can save a lot of money by going this route as well! How do I obtain a ccTLD? Just about any site where you can register new top level domains can get you hooked up with a ccTLD – just make sure it is an ICANN-accredited registrar (there are hundreds, donâ? ?t worry). For the most part, ccTLDs are open to anyone in the world regardless of your country of origin- however you will occasionally run into some international extensions that have some restrictions. You will probably find that ccTLDs are far cheaper than most of the decent .com addresses left on the board as well. Not to mention, you can normally register exactly what you want – whereas on the .com level, every three and four letter combination has been completely used up. Guest author Marianne Ross is an online marketing enthusiast who spends most of her time online and loves to share her thoughts and articles on various channels in topics related to business, social media, marketing and SEO.Â If you have any question to ask from her, feel free to leave a comment below.